Besides farming and mining, you can earn money by catching and selling fish. To get started you'll need to get a Fishing Rod. Head to the mountain area and talk to Gilbert the wandering bard. He'll give you a spare Fishing Rod for free. There are three fishing locations in the game: 1) the southwest corner of Chestnut Town, by Hunter's Animal Shop, 2) the mountain area by Gilbert's tent, and 3) the stream running through your farm. To go fishing, just walk up to the water's edge and an action grid will appear in the water. Tap on any of the squares in the water to cast your line. It won't matter which square you select in the water. Once your line has cast and you see your bobber in the water, you will see shadows that represent the variety of fish that are available at that time of the day. When a fish bites your bobber you will see it sink in the water and a ! will appear above your head. At that time repeatedly tap the touch screen on your device to reel in the fish. Sometimes when casting your bobber you won't see any fish shadows appear. 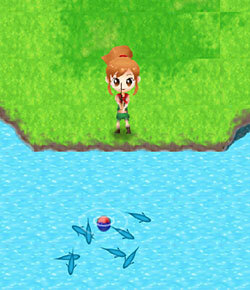 Tap the screen again to reel in your line, as no amount of waiting will make fish appear. You'll just have to try again. Sam has fishing bait for sale in his shop. Regular Bait is 50 G each, Good Bait is 100 G, and Excellent Bait is 300 G. Using bait while fishing seems to speed up the time it takes for a fish to bite your bobber. If you have to reel in your line for any reason, you won't lose the bait you have attached. For the most part, using bait is optional. Only the Excellent Bait has a real purpose. During the Summer season you can catch the elusive Arowana and Alligator Gar by using Excellent Bait in the very southwest corner waterway of your farm, which you will need to cross the bridge to get to. There are 11 types of fish you can catch in Seeds of Memories.